Iron Maiden picked up Best Album for 'The Book Of Souls' at the 2016 Metal Hammer Golden God Awards. The 'Run to the Hills' hitmakers took home the gong at the awards bash held at Eventim Apollo in Hammersmith, London on Monday night (13.06.16). Elsewhere, former Slipknot drummer Joey Jordison was crowned 2016's Golden God taking home the most prestigious prize of the night, which has previously been given to Megadeth's Dave Mustaine, Marilyn Manson and late Motorhead frontman Lemmy. Motley Crue's Nikki Sixx received the Icon Award while metallers Anthrax took home the Inspiration gong. Halestorm's Lzzy Storm was crowned Dimebag Darrell 'Shredder' and Motorhead's Phil Campbell was hailed the Riff Lord. In the young band categories, Asking Alexandria were voted Best UK Band, Southampton's Creeper picked up Best New Band and the Breakthrough prize went to Beartooth. 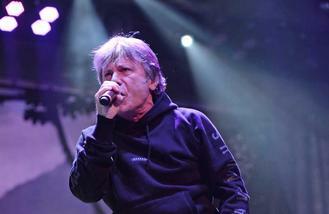 Other artists to be recognised included Best International Band winners Ghost, Best Underground went to Enslaved. The evening - which was hosted by by Hatebreed's Jamey Jasta - ended with A Salute To Lemmy, who passed away in December from cancer. Metal Hammer magazine editor Alexander Milas said: "There's only one publication in the world capable of putting such a broad range of talent under one roof, and that's Metal Hammer. "For our 30th anniversary we pulled out all the stops, but it's really our Salute To Lemmy that's hit the loudest note. His legend will always live on." Lil Wayne put his seizure drama behind him to perform at the E3 Expo in Los Angeles on Wednesday (15Jun16). Taylor Swift has found love with another British hunk just two weeks after breaking up with Scottish DJ Calvin Harris. Janet Jackson's brother Tito Jackson has confirmed his baby sister is not using a surrogate to become a first-time mum at 50. Brian Wilson wishes he had never experimented with drugs. Red Hot Chili Peppers' Flea had to relearn the bass after his snowboarding injury. Former Pussycat Dolls star Ashley Roberts has landed a new gig as the host of U.S. travel and lifestyle show 1st Look. Tony Visconti has apologised for offending Adele. Kaiser Chiefs have shared new love ballad 'Parachute' from their forthcoming album 'Stay Together'. Lady Gaga has deemed the Orlando nightclub shooting "an attack on humanity itself".